Delavan Lakes has the latest technology and specialized training to perform ultrasounds of internal organs as well as echocardiograms of your pet’s heart. Our on-site facilities allow us to directly treat your pet without having to refer to other centers. Ultrasound, a high-tech tool long used in human medicine, is bringing new benefits to an increasing number of animals every year. Veterinarians in growing numbers have begun using ultrasound to diagnose illnesses and chart a course of treatment – often at less risk and suffering to the animals and less cost to their owners. Delavan Lakes Vet Clinic has been using ultrasound for years, and we recently upgraded our equipment and training to take advantage of the latest technological breakthroughs for our patients. 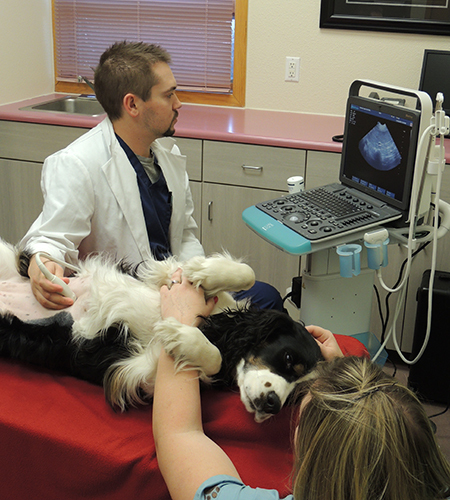 Veterinarians are using ultrasound as a complementary tool in radiology. It enables them to peer inside a pet's body and to view more detailed images of tissues than provided by X-rays. Anesthesia is not required, as it can be for X-rays. Tissue biopsies can be taken by using an ultrasound scan to guide the biopsy needle to the required area through a tiny incision in the skin. Abnormal fluid accumulation in the chest cavity, around the heart, or within the abdominal cavity is easily removed under ultrasound guidance. Ultrasound may confirm that surgery is essential e.g. to remove a foreign object in the bowel. An ultrasound may identify conditions that surgery will not help, such as multiple invasive tumors.